Staining formalin-fixed, paraffin-embedded human tonsil with Mouse anti Human CD19 (MCA2454). Western blot analysis of Raji human Lymphoblastic Burkitt's lymphoma whole cell lysate probed with Mouse anti Human CD19 (MCA2454) antibody followed by HRP conjugated Goat anti Mouse IgG, visualized by chemiluminescence. Mouse anti Human CD19 antibody, clone LE-CD19 recognizes an epitope within the C-terminal cytoplasmic tail sequence of human CD19, a single pass type I transmembrane glycoprotein containing two C2 type Ig-like domains in the N-terminal extracellular region and four potential phosphorylation sites for tyrosine together with a single serine in the cytoplasmic region. Human CD19 is expressed on virtually all cells of the B-cell lineage with the exception of plasma cells and plays a regulatory role in B-cell differentiation and proliferation. 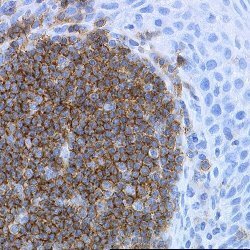 Mouse anti Human CD19 antibody, clone LE-CD19 has been successfully employed for the immunohistochemical demonstration of CD19 in formalin fixed, paraffin embedded tissues (Streeck, H. et al. 2011) and for the detection of CD19 in cell lysates by Western blotting. CD19 peptide CGPDPAWGGGGRMGTWSTR (C-terminus) coupled to KLH. Spleen cells from immunised BALB/c mice were fused with cells of the X63-Ag8.653 myeloma cell line. Ogembo, J.G. et al. (2012) SIRPα/CD172a and FHOD1 Are Unique Markers of Littoral Cells, a Recently Evolved Major Cell Population of Red Pulp of Human Spleen. Herting, F. et al. (2014) Enhanced anti-tumor activity of the glycoengineered type II CD20 antibody obinutuzumab (GA101) in combination with chemotherapy in xenograft models of human lymphoma. Leuk Lymphoma. 55 (9): 2151-60. Inoue, T. et al. (2010) Differential expression of glycogenes in tonsillar B lymphocytes in association with proteinuria and renal dysfunction in IgA nephropathy. Clin Immunol. 136 (3): 447-55.